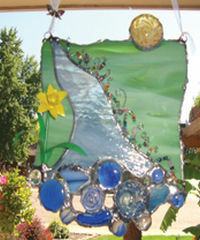 To discuss your project, please call glass artist Tiffany at (970) 576-5546 or email Tiffany@RedManxStudio.com. 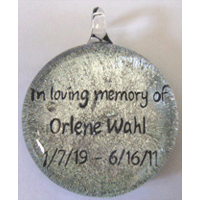 Photos and details of prior custom glass cremation projects are shown below. 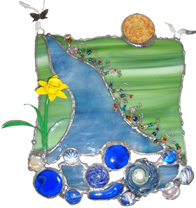 More color and style options can be seen in the glass gallery​ and mixed media gallery. More than 50 colors are available! There are no additional charges to change colors, so feel free to customize! ​These mixed-green keepsakes were made to honor a father's Irish heritage. They were created from the Sun Catcher line. Having no loop, they lie nice and flat on the desk. When a young woman lost her boyfriend of many years, she asked me to work with her to think outside the box for this custom tribute piece. Right away she mentioned that he loved Pink Floyd and all things psychedelic, bringing me to think of glow-in-the-dark glass that I've worked with in the past. 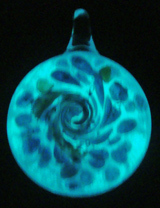 The pendant I came up with appears as normal in daylight, but glows in the dark as seen in the picture on the right. After a local copper artist passed away, his wife and daughter asked me to incorporate some copper shavings from his workshop into sun catchers to memorialize him. ​Copper is compatible with my line of glass and the pieces turned out beautifully! 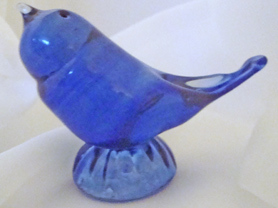 Fond memories of a blue glass bird at Grandma's house is what prompted a woman to request these figurines. Her Grandmother's ashes are nestled in the bases. 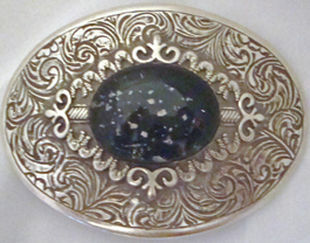 This buckle was a father's favorite for many years. Knowing that a necklace was not his style, he asked that I replace the turquoise center with a glass piece containing his daughter's ashes. 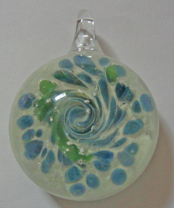 The vortex marble offers an alternative to ash art pendants. Two sisters had me design these window hangings to portray the lives of their parents. 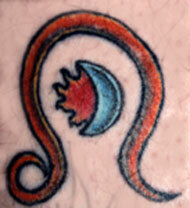 The sun containing the mother's ashes and the daffodil signify their mother and her cheery nature. The beads along side the stream come from a collection their mother used while teaching Campfire Girls. The father loved fishing, hence the stream and the blue ash piece at the bottom containing his ashes. This memorial art piece was created for a man to replicate his twin brother's tattoo. 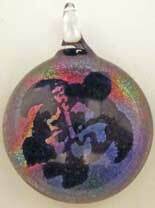 Dichroic glass is great for creating specific images! 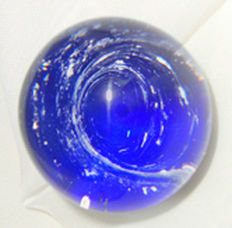 The shiny coating is also referred to as "dichro". 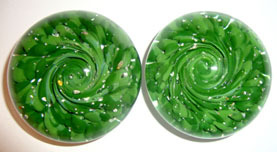 Dichro is available in a variety of colors, and comes to me as a solid pane of glass. 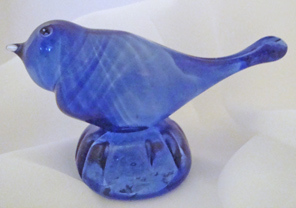 I can carve specific images from the shiny coating, then work the dichro piece into clear glass. Backing the artwork with a darker color of glass allows the carved image to appear. 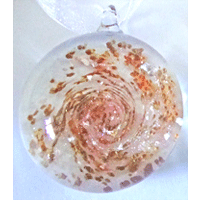 During the blowing of the glass, ashes can be incorporated between the layers of dichro and the dark glass or they can be encased on the back. The photos below show the versatility and beauty of this custom option. 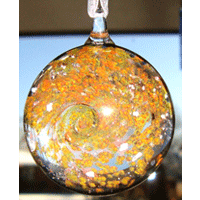 There are many more dichro colors shown in the Glass Gallery. 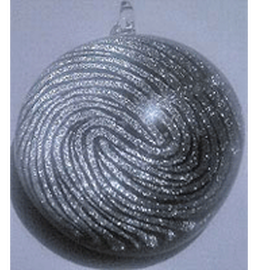 This ash art ornament was created for a young lady whose father unexpectedly passed away a few weeks before her wedding. 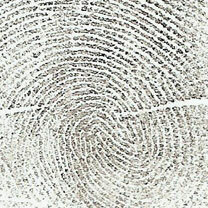 It incorporates his fingerprint and ashes. She tied the ornament to her wedding bouquet. 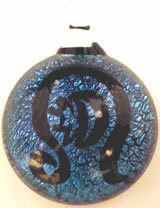 This Ash Art pendant was created for a man to memorialize his infant daughter. 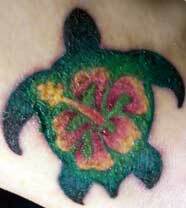 It incorporates her ashes and the symbol for "Daughter". The father is an artist himself and he was able to come to my studio to talk me through the unique shape he envisioned.